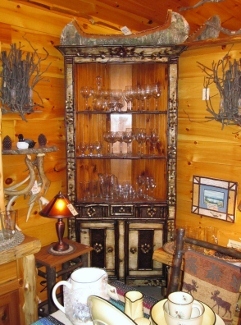 All of our large, spectacular hutches have been designed by us and built and twigged by our craftsmen. 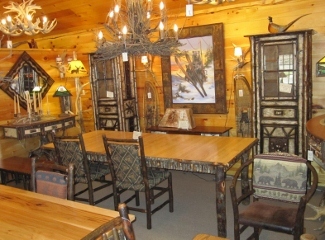 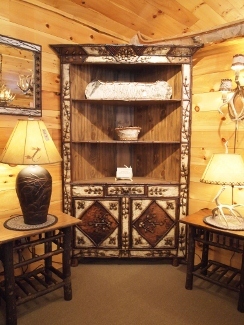 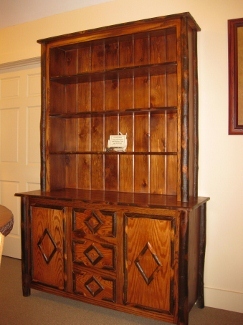 We have very talented artisans that make each hutch a one-of-a-kind piece that will make a great addition to any home whether you have a Great Camp, a cabin in the woods, or a house in New Jersey! 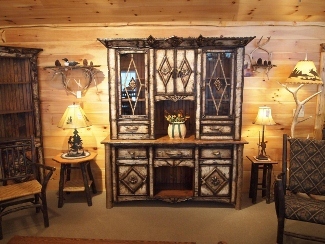 Our hutches are made with different woods to create a classic design requiring weeks of labor to build. 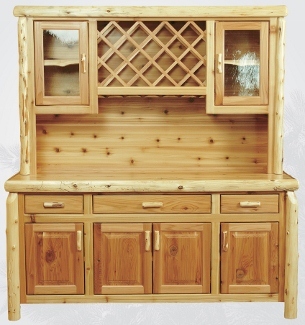 We select kiln dried hickory, maple, cherry, yellow birch and other woods for their color and grain to make the hutch not only beautiful, but sturdy. 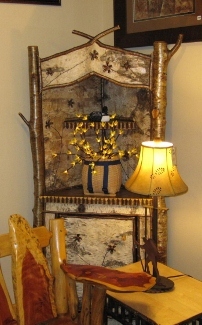 Our birch bark artisan then begins the long process of decorating each hutch with it's own individual style of birch barking and twigging making every hutch a one-of-a-kind piece of art. 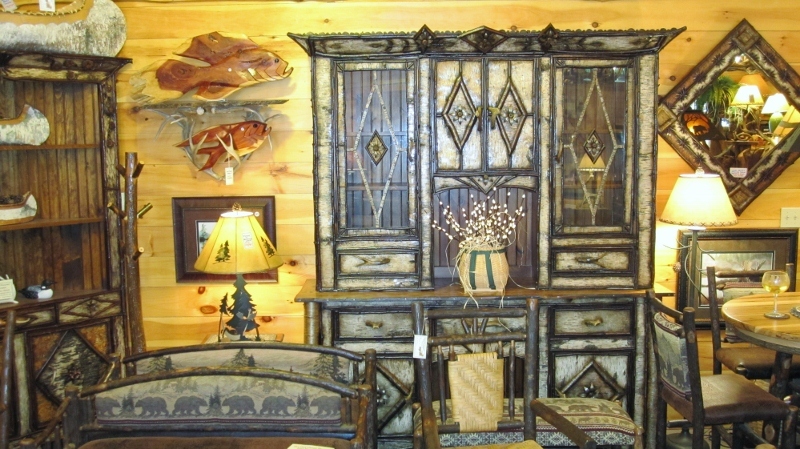 Our corner cabinets are made with drawers and cupboards to fill with all your favorite linens and dinnerware. 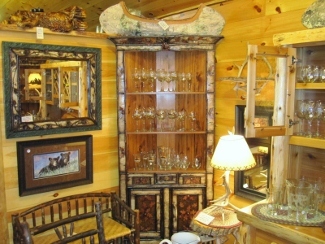 Your special serving platters and bowls, wine glasses and carafes will look beautiful in the open shelf areas. 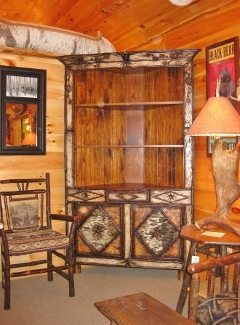 You can choose a large wall hutch to make a grand statement in your dining room or decide on a smaller corner hutch that will fit perfectly where you have a special collection you want to display and enjoy. 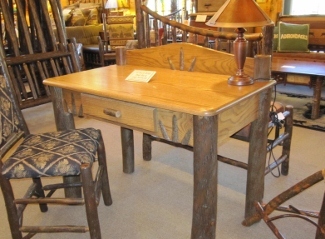 Adirondack styled desks are designed in pine or oak with one, two, or three drawers trimmed in rustic hickory skirting or birch bark twigging. 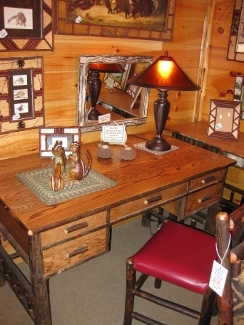 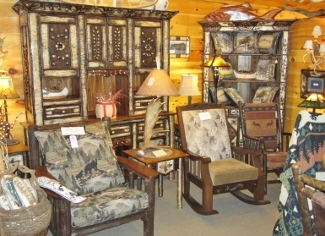 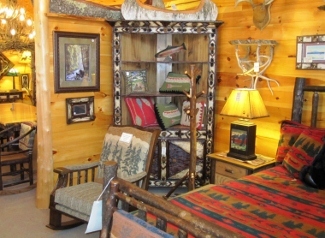 We have several rustic designs to offer you and all can be custom made to fit in any corner of your cabin. 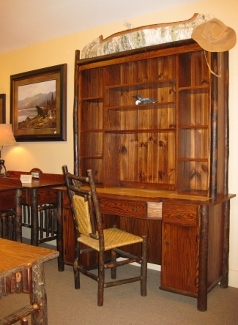 We make a beautiful "Sportsman's Desk" with a bookcase top that has lots of room for all your books and framed photos of "the fish that got away". 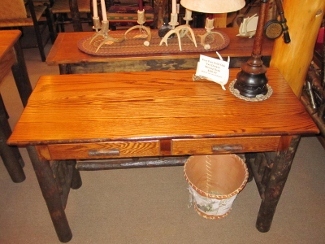 The desk table top is detailed with a maple inlay writing surface, roomy side drawers underneath for storing your clutter and lots of leg room for a comfortable place to work. 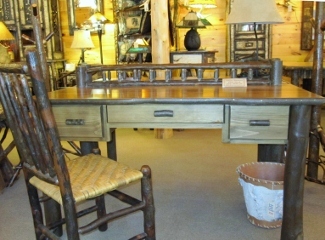 Our rustic TV consoles can be made in pine or oak with sturdy hickory legs and a solid wood top. 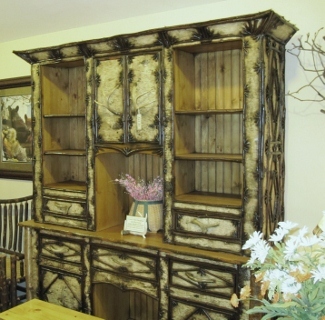 A lower shelf with open access for your DVD player and plenty of storage area with two closed cabinets with interior shelves. 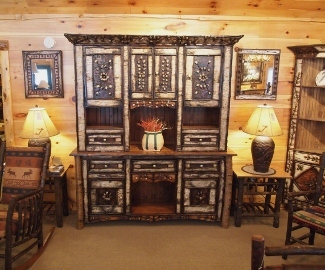 The consoles can be made for you in 36", 42" and 50"sizes with different designs and dimensions to make a perfect entertainment area in your cabin or lodge.